You must be a member of the Madrid La Dolce Vita Group to attend this activity. Would you like to join this group? La Dolce Vita Lifestyle Lovers! Here we are with our fifty-second activity! Let's meet at this warm and friendly place to say our group "Dolce" hello to the Protected content , with wonderful Japanese treat (unlimited buffet of Sushi and Unlimited Sake) and one more time, meet our old and new friends, and share the beautiful moments of Dolce Vita with alike you people. We will enjoy of Freshly prepared, tasty and Unlimited sushi during two hours,and for those who would like to pair it with a drink, there is an option of unlimited Sake open bar(for an additional price). It looks like a lot of fun! 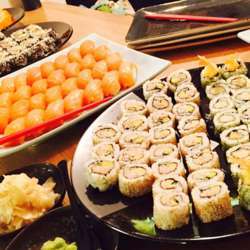 The buffet of sushi costs 25,00 and you are free to eat as much sushi as you want during our stay in restaurant. If you choose an option of Unlimited Sushi buffet + Open Sake Bar, you may have it for 35 euros. The venue is not big and the dinner will have a private character, and the space will be reserved only for us. By this reason everyone who are sure that he/she will be able to join us for this dinner, need to contact me privately (by WhatsApp or personal message here), and I will give you the details how and where, you will transfer 5 euros in advance (it needs as a deposit, it will be returned to you when you come to the restaurant). Only first 12 people who transferred deposit by 28/01, will be confirmed for the dinner. Please come and join us, everyone is welcome, independently of his/her age, marital status and nationality, the only requirement is to desire to live you life at maximum!!! !